Grammy's Attic: The Reindeer are Loose! It's Friday and we have a new challenge starting at QKR Stampede. Our theme is always "Anything Goes" but I stayed with the Christmas theme I've been doing since the beginning of last month. 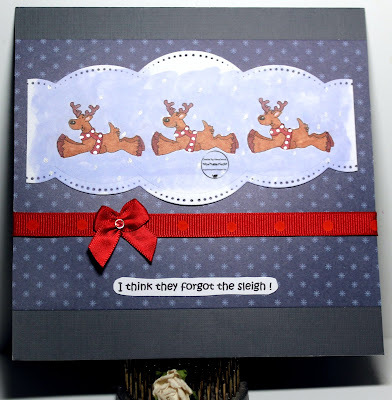 This time, I used an image from our sister brand, Eureka Stamps, and it's called "Jumping Reindeer ES3202." In order to get the sense of a team of Santa's reindeer, I used the image 3 times in a row. I colored with ProMarkers and Copics, plus white gel ink. I used a border die from Spellbinders to cut the image, then layered them onto polka dot paper from DCWV. I used my "Linen" embossing folder on deep blue CS, then used that for the card front. Simple, fun, and flat for mailing! Love this card Connie, the reindeer are wonderful and of course love the cute bow. I bet they're heading for the sleigh right now. SO cute and love the card design for them. I love those jumping reindeer!! So adorable and cute!! BRILLIANT I am laughing out loud, you have the greatest ideas for sentiments, a FABULOUS card. Oh dear.....aren't they the sweetest deer? So cute flying high! Love your design and coloring! Thanks so much for playing along with us again at The Double D, 'Run Run Rudolph' Challenge, Donna, DT Member. I love the idea of these running reindeer. Your card design shows them off perfectly. Oh so adorable Connie! Thanks so much for joining in the fun at our Double D ‘Run Run Rudolph’ challenge! Good Luck and we hope you’ll come back often. Pretty card. I love the flying deer. Great look. thanks for sharing over at Aud Sentiments. The cutest little reindeer!! Thank you for joining our challenge at Double D!